Peculiarly Kelantan’s Monarchy: Royal Rumble…! While their father, H.H Sultan of Kelantan, Sultan Ismail Petra still receiving treatment in Mt. Elizabeth Hospital in Singapore, turbulence struck the royal family, just days after his Syariah Court win over his estranged wife, the Tengku Temenggong of Kelantan, Tengku Muhammad Fakhry Petra is back in the courts again. This time, he’s challenging the decision of his eldest brother – the Kelantan Regent – who revoked his membership in the Kelantan Succession Council on Sept 16. The council confirms the succession to the throne in Kelantan and will determines whether there is a vacancy in the throne by reason of a prolonged absence of the reigning sovereign. 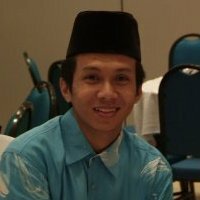 Tengku Muhammad Fakhry, 31, the third son of the Sultan of Kelantan, is third in line to the throne. The Sultan appointed him to the council in or about 2001. It was just on Sunday that he scored a victory in Kota Baru when the Syariah High Court judge ordered his 18-year-old wife Manohara Odelia Pinot, a former Indonesian model, to return the RM1.2mil she borrowed from him. This time, the Kelantan prince has taken his case to the civil courts. He is applying for leave for a judicial review in the High Court here of the decision by the Regent, Tengku Muhammad Faris Petra, to remove him from the council. Yesterday, Tengku Muhammad Fakhry’s lead counsel K. Shanmuga submitted that the Regent’s action amounted to a usurpation of the Sultan’s powers because, under the implemented Kelantan State Constitution, only the Sultan could alter the council’s composition. The Regent holds office only for so long as the Sultan is incapacitated. In his statement filed for the judicial review application, the prince said the Sultan had been critically ill since May and his brother was appointed Regent effective May 25. He said the Sultan, who has been in hospital in Singapore since May, now appears to be recovering. Shanmuga contended that while the Regent was first in line to the throne, his succession was not automatic as the council must first confirm him as the reigning sovereign. If neither the Regent nor the Tengku Bendahara – who is second in line – were confirmed, Shanmuga said the Tengku Temenggong would be next in line. 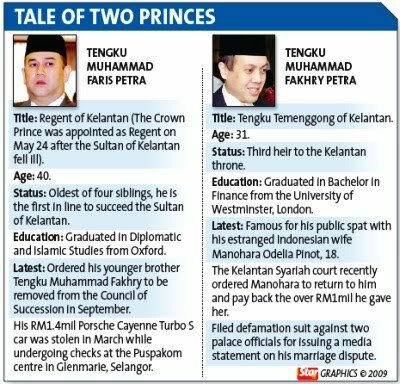 In his application filed on Dec 1, the prince had named Tengku Muhammad Faris, 40, the Kelantan Government, the council secretary and five others who had been appointed to the council by the Regent on May 24. Among others, the prince is asking the court to set aside the Regent’s decision or, alternatively, to declare the revocation inconsistent with the Kelantan Constitution. Shanmuga argued that allowing the Regent to alter the composition of the council effectively granted him the ability to create a tribunal that would determine his fitness to succeed to the throne. He contended the Regent’s decision was justiciable , adding that it was of utmost importance for the court to ensure that the constitutional mechanisms designed to protect the dignity of the succession operated in accordance with the law. « Unprecedented Kelantan: From KB Mall to KB Fall..